This article is about the film. For other uses, see School Daze (disambiguation). School Daze is a 1988 American musical comedy drama film, written and directed by Spike Lee, and starring Larry Fishburne, Giancarlo Esposito, and Tisha Campbell-Martin. Based in part on Spike Lee's experiences at Atlanta's Morehouse College, Spelman College, Morris Brown College and Clark Atlanta University, it is a story about fraternity and sorority members clashing with other students at a historically black college during homecoming weekend. It also touches upon issues of colorism and hair texture bias within the African-American community. 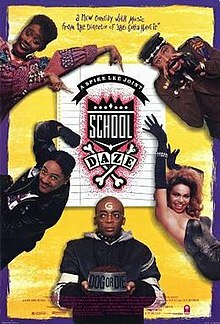 The second feature film by Spike Lee, School Daze was released on February 12, 1988 by Columbia Pictures. Vaughn "Dap" Dunlap (Larry Fishburne) is a politically conscious black American student at Mission College, a leading historically black college in Atlanta, Georgia whose motto is "Uplift the Race." The college administration is portrayed as inept. Dunlap feuds with Julian Eaves (Giancarlo Esposito) aka Dean Big Brother Almighty of Gamma Phi Gamma Fraternity, Incorporated. This group is characterized as "wannabees," as in "wannabe better than me." The fraternity brothers are preparing for a big college football weekend and Homecoming parties. Meanwhile, Dap's younger cousin, Darrell (Spike Lee), aka "Half-Pint," is a Gamma pledge. Eric Payne as Booker T.
Monique Mannen as Monique "Mo-Freak"
Spike Lee arranged for the two groups of actors to stay in separate hotels during filming. The actors playing the "wannabees" were given better accommodations than the ones playing the "jigaboos." This favoritism contributed to tension on the set, which showed in the on-camera animosity between the two camps. (The producers used a similar tactic in filming Animal House, with similar results.) In School Daze, the method approach yielded strong results — the fight that occurs at the step show between Dap's crew and the Gammas was not in the script. On the day the scene was shot, the fight broke out between the two sides. Lee ordered the cameras to keep rolling. The film received positive reviews for its exploration of issues within the black community. Roger Ebert of the Chicago Sun-Times noted, "There is no doubt in my mind that 'School Daze,' in its own way, is one of the most honest and revealing movies I've ever seen about modern middle-class black life in America." He also noted its frank exploration of issues of discrimination within the black community related to skin tone and nature of hair. He said it was significant as a film with a "completely black orientation. All of the characters, good and bad, are black, and all of the character's references are to each other." On review aggregator website Rotten Tomatoes, the film holds an approval rating of 59%, based on 22 reviews, and an average rating of 5.8/10. ^ "School Daze (1988)". Box Office Mojo. Retrieved November 11, 2008. ^ a b c d e Campbell, Tisha; Cundieff, Rusty, Nunn, Bill; Bell, Darryl M. (2005). Audio commentary for School Daze (DVD). Sony Pictures Home Entertainment. ^ a b Ebert, Roger (February 12, 1988). "School Daze". RogerEbert.com. Ebert Digital LLC. Retrieved April 9, 2018. ^ "School Daze (1988)". Rotten Tomatoes. Fandango Media. Retrieved April 9, 2018.